Tag Archive | "Ed Holtzlander"
I am not a resident of the Village of Sand Lake, but I am in the area serviced by the Sand Lake Fire and Rescue. I was appalled when I read the recent article about one of the units being taken to a parade in an area not even served by Sand Lake when back-up is needed. Just thinking about the risk this created for those of us who often work in fields and woods not accessible to the big, heavy, awkward vehicles gave me a horrible sense of abandonment. Is there no common sense in politicians? The Unit Being taken without the knowledge and consent of the Fire Chief, Ed Holtzlander; definitely WRONG. The Unit Being taken and used to support a politician; NO BRAINER. Again I ask, Is there NO common sense in politicians? Some tempers are flying hot again in the Village of Sand Lake after Village President Tom Norton took a Sand Lake Fire Department grass fire/medical truck without discussing it with the Fire Chief and allowed someone in the Curt Benson for Judge campaign to drive it in the Pulaski Days parade last Saturday, October 6. The Post got a tip about it from someone earlier this week, and then called Fire Chief Ed Holtzlander to verify what had happened. According to Holtzlander, he went into the fire station Saturday and saw it was missing. “We already had engines 6 and 7 reserved to go to Cedar Springs for the Red Flannel parade and now this one was missing. We use it for grass fires but it’s also our second medical truck,” explained Holtzlander. He said he found out that Norton had spoken with a DPW taking the truck. When Holtzlander saw it was missing, he immediately called Norton. The pickup did arrive back at the building about 20 minutes later. But none of the firefighters recognized the guys who brought it back. The Post spoke to Norton about it, and he verified that he did take the truck without calling Holtzlander. “The Chief doesn’t run the fire department, the President of the Village does,” stated Norton. When the Post asked why he didn’t call him and let him know, Norton responded, “The Chief never calls me back anyway.” He also said he had a new phone and didn’t have everyone’s phone number in it. The email was reportedly sent at 12:30 a.m. Saturday morning. But Holtzlander said that’s not the case. It’s also a four-wheel drive vehicle with medical supplies and they just recently used it to get back to where someone had fallen out of a tree stand. But who was driving it in the parade? Norton said he swore a guy into the village so that he would be covered by the village insurance and legally be able to drive it. In the email that was sent out (which Norton read to the Post over the phone) it was mentioned that doing this would help with grants by making other community’s parades look bigger. The Post spoke with some other Village sources (not Sand Lake) who said that they knew of nothing like that. Instead, they said they don’t allow the use of Village property for political purposes to avoid the look of impropriety. “I’m appalled,” said Sand Lake Village Council member Danielle Hardenburg. “I did some investigating and don’t like what I found out at all,” she said. Norton’s term will be up this fall and he will soon be moving out of Sand Lake. Hardenburg, who will run for Village President as a write-in in the November election, said she plans to call for Norton’s resignation at the next meeting. 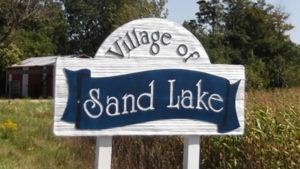 The next Sand Lake Village Council meeting will be Monday, October 15, according to the dates posted on their website.